Enterprise Forms Server is our powerful eForms management system, enabling an organisation to host, control, process, and archive any number of blank and completed eForms, both online and offline, across the enterprise and externally to partners and customers. Blank forms are presented in a user friendly, categorised way with mouse-over descriptions and thumbnail images. Access to different categories of forms may be individually controlled by users with administrative permissions. Public users do not have to create an account to fill in forms – prior registration is a significant deterrent to using many online services. With Enterprise Forms Server, public users can go straight to forms, and may fill, save and submit forms without hindrance; eForms are simply linked directly to any location within an organisation’s website. Access to the eForm System used internally by organisations is limited to registered users only for security. Users will provide a unique username and password when they first log into the system. 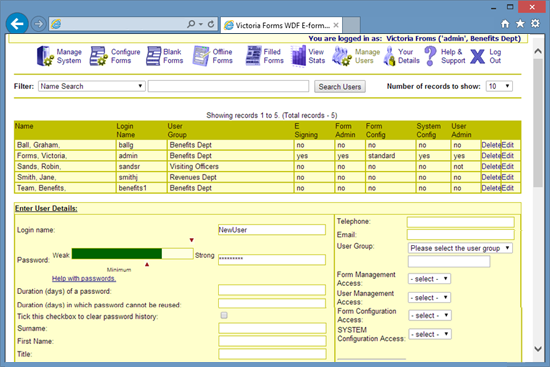 Appointed system administrators can control staff access levels via a user management screen where they may add users, change details – such as allowing access to specific eForm categories, etc. Staff contact details may also be recorded here for use in letter templates. When a registered user makes a change to an eForm, their name, the date and time of the change, and details of the change itself, will be stored. 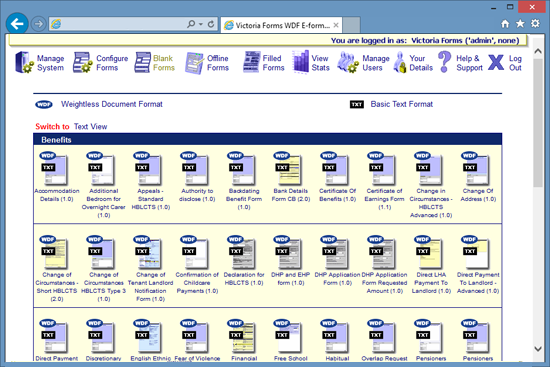 A summary of an eForm history may be viewed. For further investigation, versions of the eForm throughout its lifespan may be redisplayed from stored snapshots. 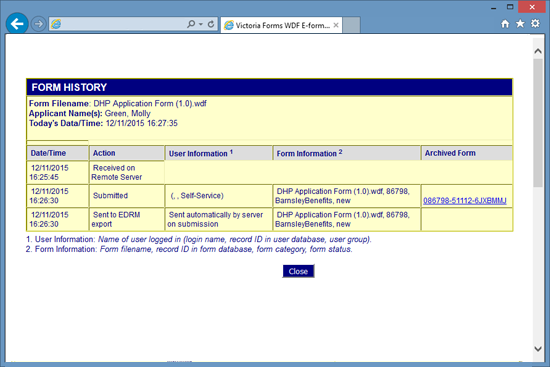 For those given authority, Enterprise Forms Server is used to control which eForms are available for offline use. Those selected are synchronised with the offline module so users can access forms when away from the network connection. A large number of eForm features are available to customise the behaviour of each form. Administrators access configuration screens to set these parameters, without any coding being required. Add a custom front page to each form, including guidance information, images, and links. This facility is particularly useful when an organisation uses a set of template forms – the ability to add their own branding and information to a generic form allows complete integration with corporate identity without expensive investment. On submission, each form can be configured to send out a notification to a department and acknowledgment of submission back to the user. The wording of the subject line and body text of receipt emails can be configured individually for each form. Internal emails may also be routed dynamically depending on the contents of the form. For example, a form submitted by someone who says they are home-bound can be routed to a different work team than other submissions of the same form. Enable users to view, save, and print a PDF version of forms. This option is useful for users who want to keep a permanent record of a filled form without wasting paper. 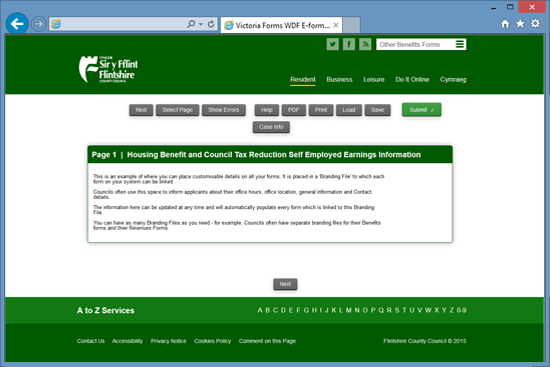 Note – The PDF form is an exact copy of the on-screen form. 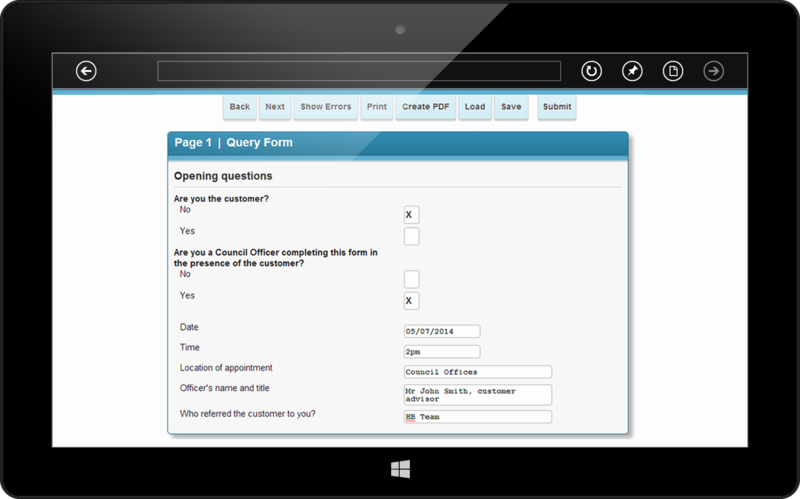 Users can access some forms for on screen filling and printing only. Resubmission can also be disabled so that once a form has been submitted it cannot be altered and resubmitted. This feature enables the user to add a digital signature to forms which still require them. Signature capture and submission does not require additional software. On submission, users are given a message confirming successful submission. This message can be customised for each form. For example, details of further instructions can be provided. In conjunction with the document and / or back-office export modules, each form can be configured to export to one or more system. In order to handle large numbers of eForms that may be produced when eForms are used internally, eForms are stored within a database. 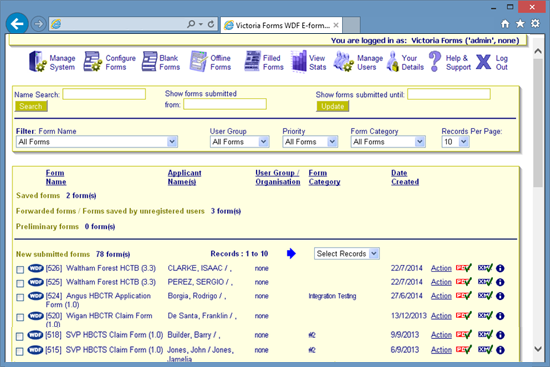 eForms may be sorted and listed on screen by date received and by applicant name. eForms may be filtered according to the date of submission, the eForm name, the eForm category or the user category. Individual cases may be found with a name and address or a reference number search..
As a case is processed it will automatically move through different categories that can be defined to fit the way that the benefit department works. A system administrator may track progress of eForms as they pass through the department, with the ability to move forms between categories, allowing a basic workflow system to be established. Forms may also be deleted (and restored). Authorised users control the export to document and back-office systems. Where Victoria Forms supplies a set of template forms, these can be quickly customised to suit the organisation hosting them. Details of the organisation name, web-address, telephone numbers, address, office opening hours, or any other custom information as required, are entered on a single set-up page within the system. This information will then appear on the template forms throughout the form library. If any of these details change in the future, all forms in the library can be updated with one change of the library branding form saving time and ensuring information is current at all times. Conversion of form pages to PDF, TIFF, JPEG, PNG. Forms are sent to document image and workflow systems. The form server tracks each case and keeps form records up to date. Form data is converted into XML format, using any published schema. Using error checking at the time of form filling, the system ensures that the form data set is complete to produce fully validated XML files. Do more with your form data. With our powerful integration options, rekeying can become a thing of the past. Enables newly submitted forms to be converted into a variety of formats for export to document workflow systems. After converting form data into suitable format, the data is then exported into back-office systems for processing.